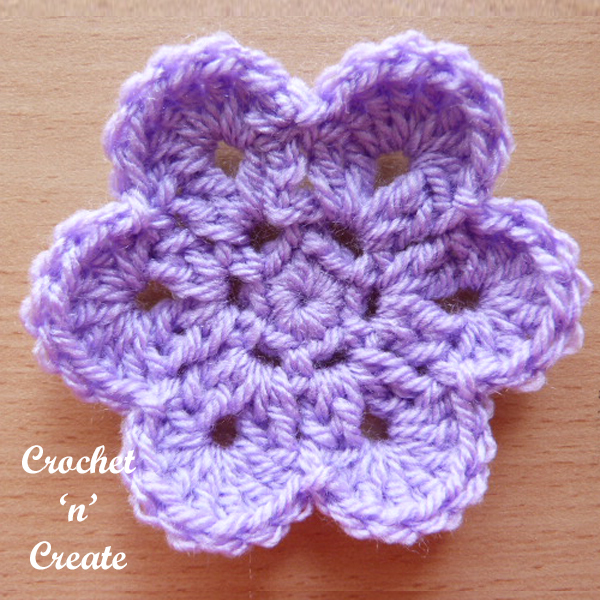 This curved edge flower is an easy and quick design I am sure you will love. 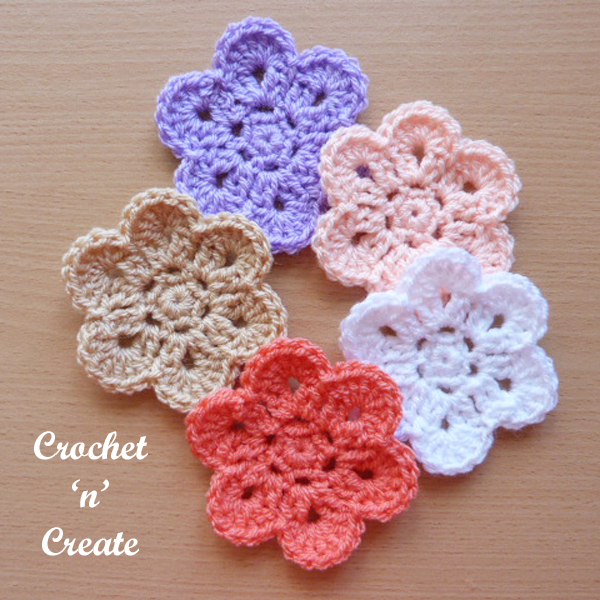 Crochet flowers are great if you want to whip up a small project fast, they are perfect if you need to make adornments for small items or if you make a few of them and join together they can be put on large items too. Use for T-Cozies, hairbands, hair clips, baby cardigans, garlands or just for fun!! Row 3 – sl st to first ch2 space, (ch3, 1dc, ch2, 2dc) in same ch2 space, * skip sc, (2dc, ch2, 2dc) in next ch2 space, * rpt from * to * to end, sl st to top of ch3 on beginning of row. Row 4 – sl st to first ch2 space, ch3, 6dc in same ch space, * skip 2dc, sl st in space between next 2dc, skip 2dc, 7dc in next ch2 space, * rpt from * to * to last 2dc, skip 2dc, sl st in space between ch3 to turn on row below, sl st to the top of ch3 on the beginning of this row. Fasten off. 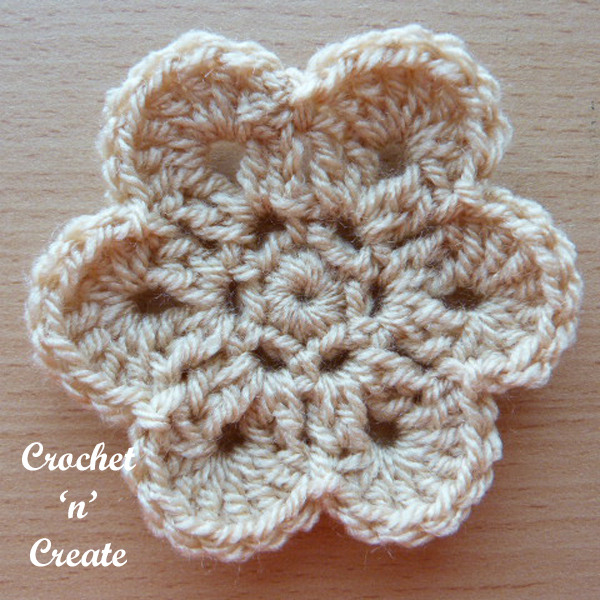 Hope you enjoy this free crochet pattern for curved edge flower. If you wish to print the pattern text only of the crochet curved edge flower, select the content you want to print, click file (top left corner on browser), then print, this should take you to your printer settings, choose selection and then OK. 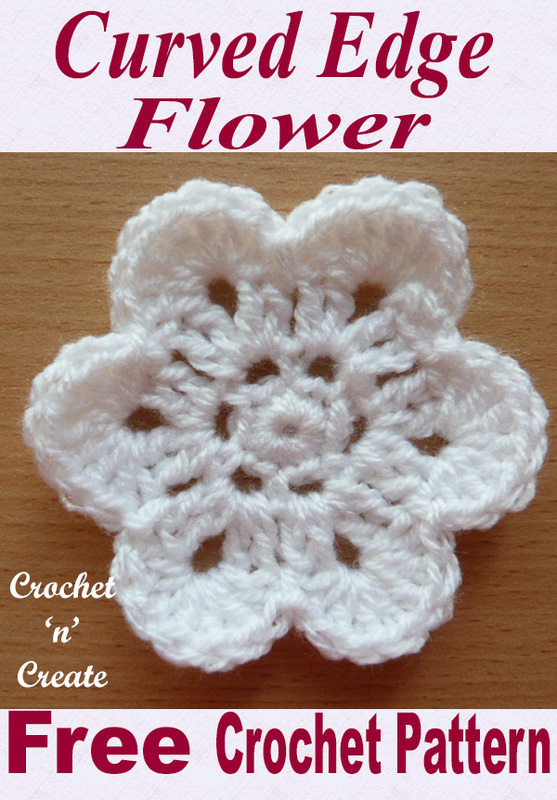 The written instructions and pictures for this free curved edge flower pattern are copyrighted to crochet ‘n’ create © 2017. 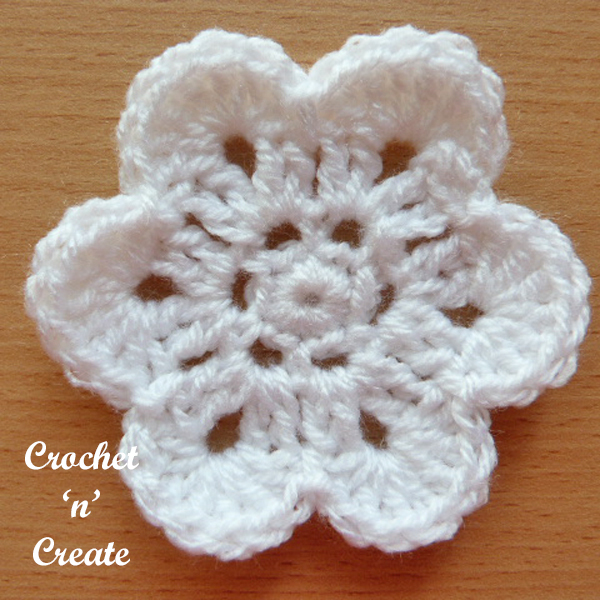 You are welcome to sell the finished products made from the free crochet curved edge flower pattern, I just ask that you please use your own pictures and put a link back to crochet ‘n’ create. 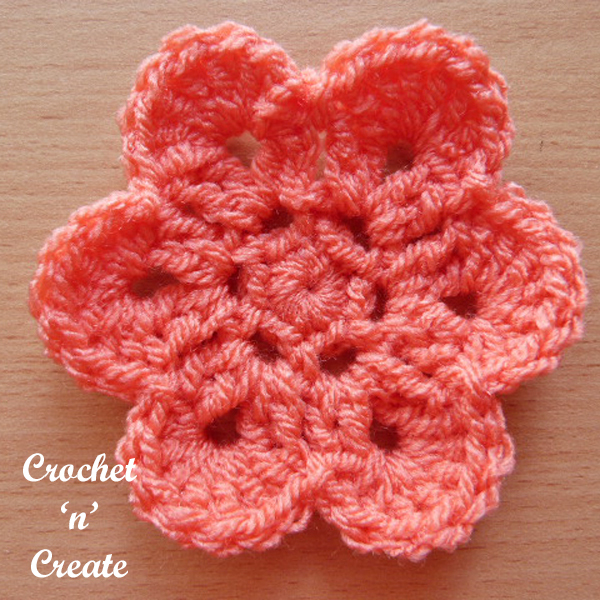 If you wish to share this crochet curved edge flower pattern on social media or your blog please only use a direct link to the pattern page on crochet ‘n’ create. 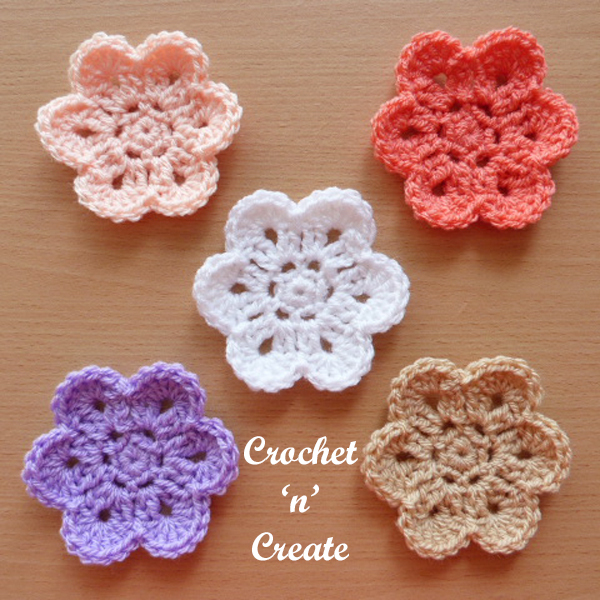 This entry was posted in Crochet Flowers, free crochet patterns and tagged crochet, crochet applique, crochet flower, free crochet patterns on 5th August 2017 by crochetncreate. I love your patterns, and hope to see more of them.